The end of the Editorial made my day. Since Dragona is our resident Zafara fan, we asked her if she wouldn't mind providing the image. 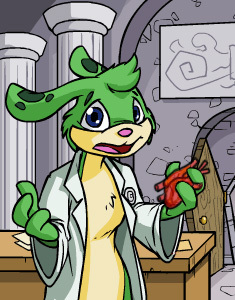 SCIENTIST ZAFARA HOLDING A FRESH HEART! Just gruesome enough to be completely unexpected. Hah, it reminds me of Dante from Surviving the World. And that chest fluff line almost makes me think it's his heart that's been cleanly cut out. Yes, just a tad bit. I play it on my iPod Touch all the time. And i have it on my droid. It's everywhere! And it's awesome! This makes me simultaneously want to do a Robot Unicorn pet and a Rainbow Dash. Notice that the mane gets rid of the horn? Thanks y'all! Wow, that is, well.. 'incredible' really isn't the word. Bizarre? And possibly just a teensy-weensy-little-bit camp? I hope it makes Vince Clarke (even more) rich. I was going to play YYB do the laundry this morning and clean the kitchen but... maybe after one more game? EDIT: Grr... need a faster graphics card. Wow... that game is addicting. O_O Thanks for sharing! This reminded me of it and I played... er, a few... games last night. A fiery death awaits you! A pretty weak answer re: "we can't predict the future" (hurrr). But hay. I would be happy with a skin. I would pay like 10 bucks for a skin. I'm really intrigued by the name change thing, personally. I'm half tempted to bank on it, trade my so-so named UC for something worse named, but a prettier pet, and sit on it until I get a NC mall perk to let me change the name. Or keep her and do the same, she's a UC Grey Uni and pretty enough if I could give her a new name! I also have a couple other pets that I would love to be able to fix the capitalization of their names. Names are huge part of pets for me, and I've gotten rid of a few pets for losing connection with the name. So I might be a little resentful, for having traded away pets that had I kept, I would've been able to change the name and keep the pet.... But then, I'm still kicking myself for not painting pets before conversion, so the resentment wouldn't be anything new.